The latest adaptation of Agatha Christie’s novel is excellent. I went to see Murder on the Orient Express the other evening with my parents and we all enjoyed it. If you’re looking for a movie to see while you visit family this Thanksgiving, might I recommend this murder mystery. The cast is almost all A-list and the acting is top notch. I was worried that some of these stars wouldn’t be able to shine, given such small screen time in their supporting roles, but such is not the case. I was particularly impressed with Willem Dafoe’s scene late in the film. I don’t want to spoil anything, but his layered levels of acting is astounding. But he’s not he only high-caliber actor in a small, supporting role who delivers. There are similar scenes that are well acted, as passengers on a snowed-in train in 1934 are interviewed by the detective about a murder during the night. Because each passenger is lying about something or another, it’s good that this movie has actors who can play these supporting roles with such subtlety. Of note are, of course, inquires directed at the characters played by Judi Dench and also Daisy Ridley. Surprisingly, Josh Gad also delivers a fine dramatic turn, when heavily questioned about his murdered employer. It doesn’t hurt that not all of these scenes take place on the train itself. In addition to the luxurious cabins that will make you want to travel by train across Europe, there are inquiries that take place outside in the brisk snow and in other train cars. The world’s greatest detective also pads along on top of the passenger car, in order to look down and place where each passenger was sleeping the night before. His investigation also takes him to the baggage car and all around the train. This movie makes beautiful use of the snowy mountain scenery and is certainly less claustrophobic than either of the 1974 film or the 2010 TV adaptation, of which I’ve seen. Johnny Depp also receives the opportunity to flex his dramatic muscles. As I’d speculated in my previous article, he was, indeed, able to portray both a suave and slimy gangster character, much as he did in the film Black Mass. His depth and skills as an actor are impressive to behold. One of the minor criticisms of this picture is that viewers wished to see more time given to the supporting characters. However, this is a Hercule Poirot murder mystery and the famous detective is front and center. 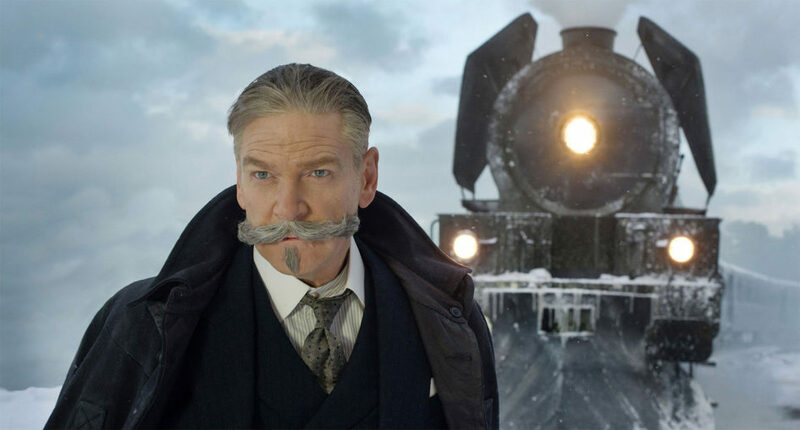 Kenneth Branagh plays the titular detective and although I wasn’t initially receptive to the look he gave the character, I understand that this was done to differentiate his performance from past portrayals. But, once he gets going, his mannerisms and methods are true to the novel. Much like the 2010 TV adaptation, there are events added to the beginning of this feature that are not in the book, but are used to introduce the characters. For Poirot, it is a case that brought him to the Middle East, which he solves in brilliant fashion. His initial introduction also sets his inclinations for seeking balance in all things, a theme that extends later in the film to balancing the scales of justice. While this movie is one of the best adaptations I’ve seen, it is by no means perfect. It is a treat to watch Poirot investigate, but not as sweet as the blatant Godiva product placement in the dining car. I’m gonna let that one slide though, because the array of treats looked delicious — little Godiva sign card notwithstanding. I also caught, but didn’t care for, the passengers to be arrayed in a setup of Leonardo da Vinci’s The Last Supper toward the end of the film. I felt the production was trying to be a little too cute. There are also extra moments of action sprinkled throughout the film — not in the book — which I understand were added for additional suspense; this being a big-budget feature. And it looks like this feature has done well at the box office. I hope it did well enough for the studio, as I would definitely be down for watching another Poirot adaptation of this caliber. Agatha Christie’s great-grandson, who is the Chairman of Agatha Christie Limited, had previously expressed enthusiasm for sequels. Actor and director Kenneth Branagh has also said he’s on board for sequels. And might Poirot find himself on board a boat on the Nile? Eagle-eared sleuths will have to listen for a remark toward the end of the film. I certainly look forward to seeing more Hercule Poirot murder mysteries adapted for the big screen.